Today, Pope Francis was in Fátima to canonize Jacinta and Francisco, two of the children who reported seeing a vision of the Virgin Mary in a field in Portugal. This sighting took place one-hundred years ago, and made Fátima one of the most popular pilgrimage destinations in the world. Learn more about the Fatima pilgrimage in this video. My pre-Camino tour of Portugal included a night stay in Fátima. Most tours just stop there for a day, but because we stayed in a hotel right next to shrine, I was able to attend the candlelight procession in the evening, as well as the mass at the cathedral the next morning. Candlelight mass before the procession. The experience was deeply moving. It was just one day before leaving for my Camino, and during a time of my rekindled faith. 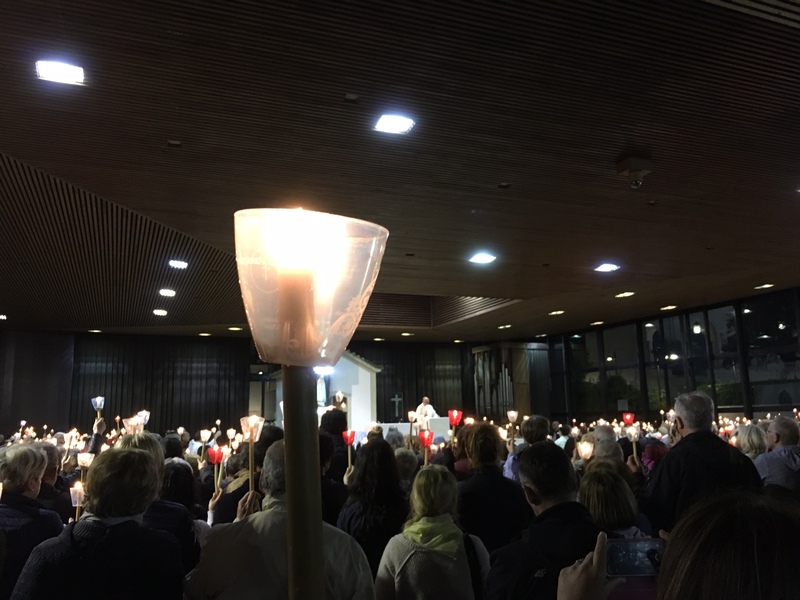 After this candlelight ceremony, I pondered the idea of getting a blessing before my journey. The next morning, I asked Pedro, our tour director, if it would be possible to arrange for a blessing before our final bus ride back to Lisbon. 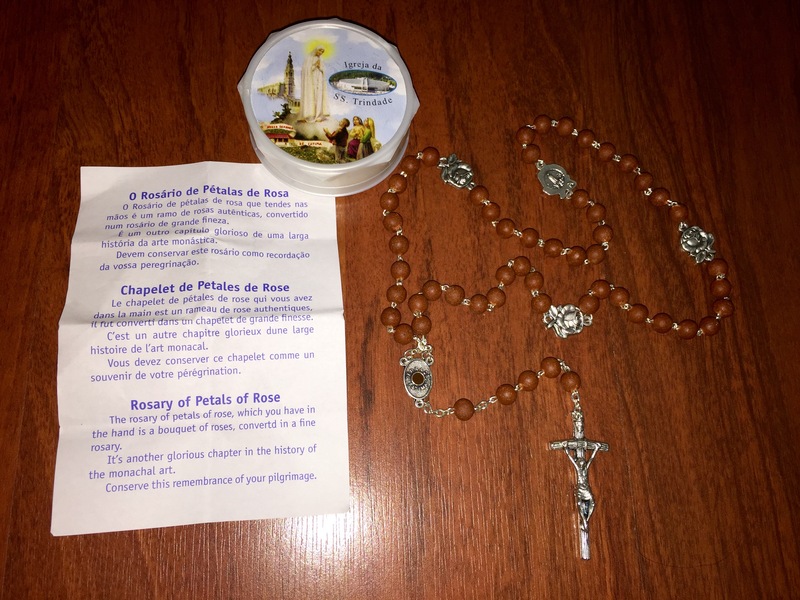 He said, “I’m sure we can make this happen.” I had faith in Pedro and decided to bring my two Camino shells and my new rosary with me instead of packing them in my luggage. After a small group of us took a tour of the Basilica, we saw a man in red robe walking toward us. Pedro politely stopped him and said some things in Portuguese, then pointed to me. The man smiled, nodded and beckoned me forward. He turned out to be a Cardinal! He said some things in Portuguese, touched my forehead, and did the sign of the cross. I responded with a sign of the cross, an amen, and with hands in prayer I nodded to him, namaste style. It all happened very quickly, and I did not have time to take out my shells, but I figured if I was blessed, then everything on me was blessed too. The impromptu blessing happened outside of the Basilica, not far from the big statue of Pope John Paul II. It was witnessed by my mom, Pedro and a handful of people on our tour. Nobody took a photo since it happened so quickly, but the experience left an indelible mark in my memory. I am so grateful that I received this blessing for a safe journey. The very next day, I started my solo Camino, walking 100+ miles to Santiago de Compostela, the bravest thing I have ever done. I have tears in my eyes just thinking about this. When I was on the Camino walking to the north toward Santiago, I saw many blue arrows pointing south toward Fátima. Yellow arrows point to Santiago, blue ones point to Fatima. 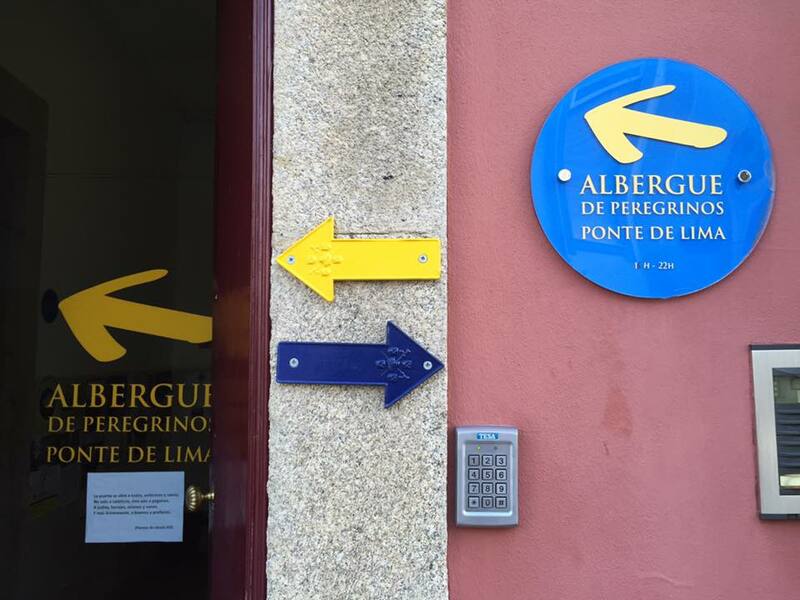 Pilgrims walking in both destinations are welcome in all albergues in Portugal. After my personal experience here, I understood the importance of the Fátima pilgrimage. I kept the rosary in my backpack pocket and brought it with me into churches along the Camino to pray. Below are photos of my experience in Fátima. Excellent story and pictures of Fatima! Laurie, congratulations on your spiritual journey and here’s to many, many more.